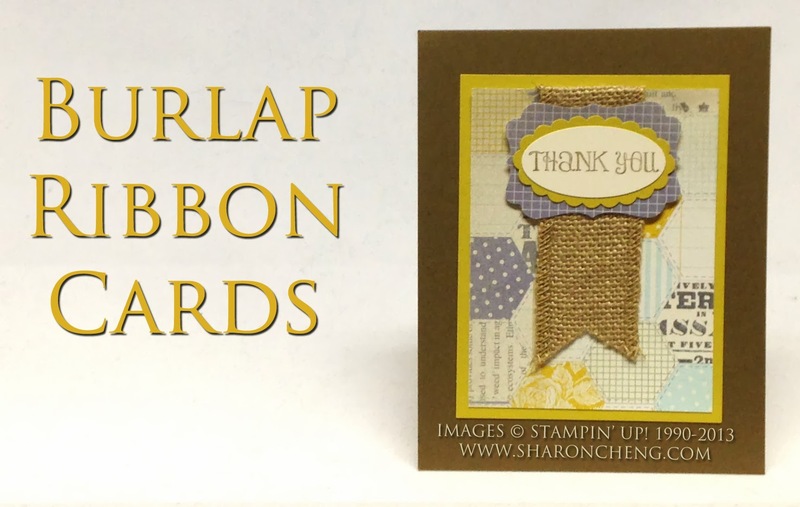 Using burlap ribbon in cards Stampin' Up! style is a fun way to add texture to your projects. 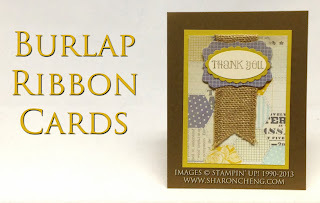 I have received several different burlap ribbon cards recently and wanted to share some of them with you. 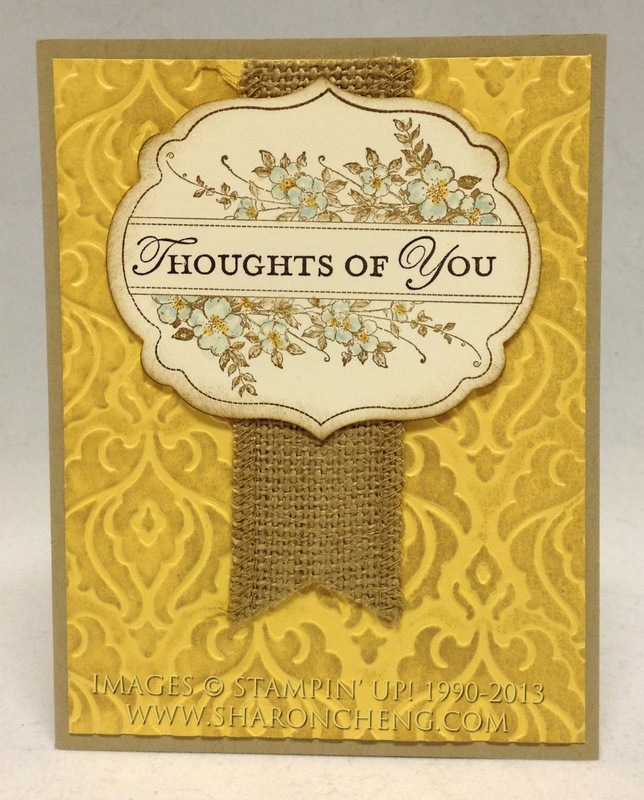 Burlap has been a popular trend for some time so I'm glad we can include it in our cards too. Kathie Rotti make this card using Stampin' Up! 's By The Tide, Perfect Pennants and Hardwood stamps. Pool Party and Brown Sugar are a wonderful color combination. In addition to the burlap ribbon, she also used the Natural Chevron ribbon from the Occasions catalog. Janet Holmes was quite creative in the way she used the burlap ribbon. See the threads under the button? Janet unraveled some ribbon and used the threads. That way you get the color and texture without the bulk. 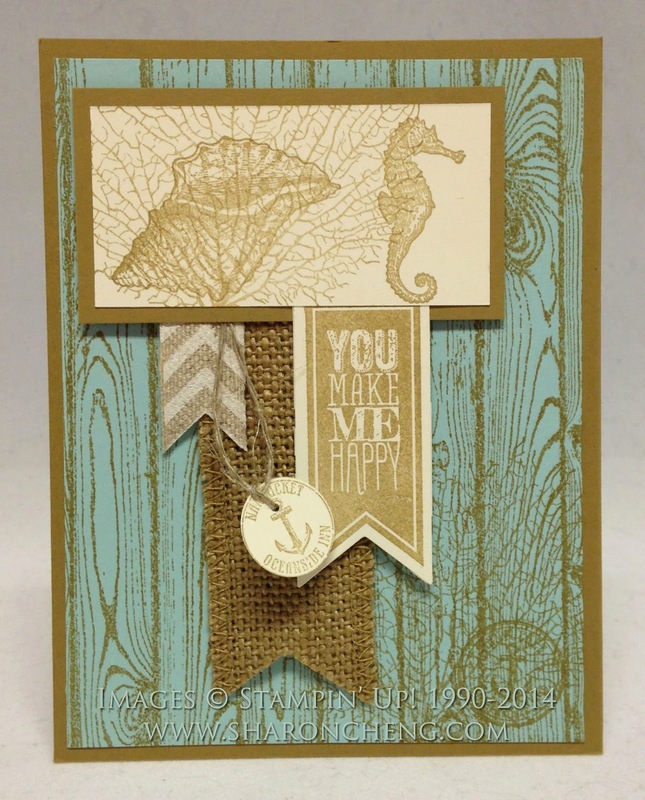 Kim Judice made this card using Stampin' Up! 's So Very Grateful stamp set and the Watercolor Wonder Designer Series Paper. The next 2 cards are a wonderful example of serendipity. While it wasn't planned, two of us used the same basic layout. You can see how to make different cards by changing out the colors and stamp sets. Michelle made this first card using Apothecary Art. This was my Leadership 2014 swap card using the Lots of Thanks stamp set and Afternoon Picnic Designer Series Paper.